How Do You Play Basketball With No Hoop? 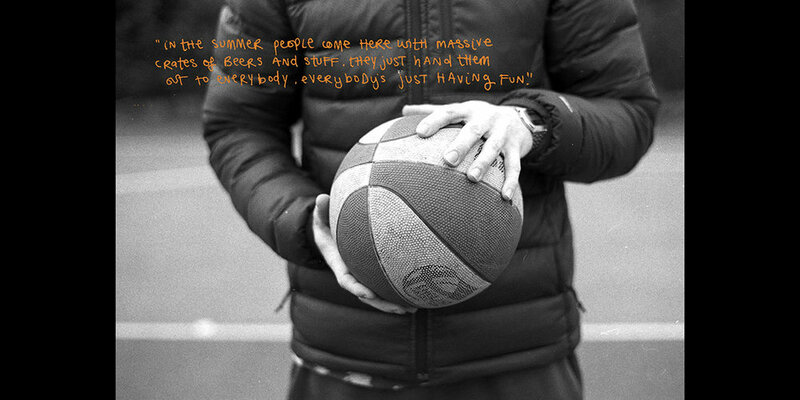 is an exploration of Argyle Square basketball court in King’s Cross and the community that exists around it. The court is little more than 5 minutes from the station and areas of redevelopment, yet it feels worlds apart. The project title is a comment on the lack of recognition by the council of how important the space is for the young people who live in the area — one basketball hoop remains broken for nearly six months whilst millions of pounds are spent across the street on brand new buildings. A handmade net bag contains stickers, a t-shirt and a publication of photos and interviews from the court. Alongside this is a poster for an imagined exhibition which would be held illegally around King’s Cross. Wheat-pasted photos and quotes from the kids would decorate the area until they were removed or covered up.